Doing business in Montreal, with a single or shared place of business, a satellite office, a branch with a postal address or simply one or more representatives based in Montreal, allows companies outside Montreal to increase their visibility, have access to a larger market, improve their image to potential clients and facilitate trade and relations on the markets of the Province of Quebec, Canada and internationally. 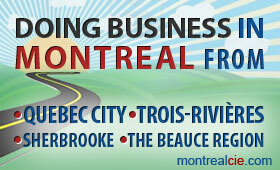 The proximity of cities such as Trois-Rivieres, Quebec City, Sherbrooke, Victoriaville, Granby, St-Hyacinthe or the Beauce region, only a few hours’ drive from Montreal, allows companies from smaller municipalities, not only to move easily to Montreal at reduced price and more regularly in order to fulfil contracts and projects in construction, but also to attract customers from Montreal to their municipalities which often offer much lower prices in the real-estate sector. Limited parking accommodation for offices or places of business. Consultants and general contractors in construction from cities, coming from Trois-Rivieres, Quebec City, Sherbrooke, Rimouski, Chicoutimi, Victoriaville, Saint-Hyacinthe, Granby, Gatineau, the Beauce region and other municipalities, will find, at MontrealCIE, all the tools to establish themselves in Montreal, find contracts and increase their turnover.